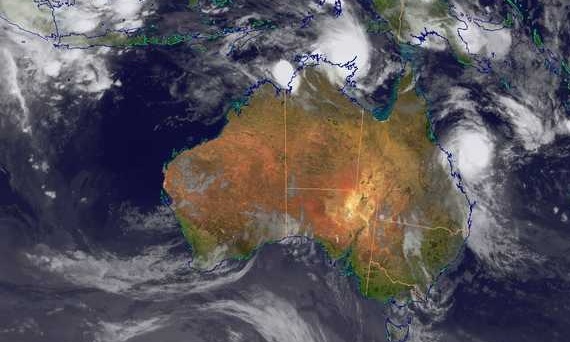 On 20 February 2015Two tropical cyclones Marcia and Lam hit Australia . This is the first incidence when two cyclones have hit Australia at the same time.Tropical cyclone Marcia is a category four storm and it made the landfall at central Queensland and left a trail of destruction over Yeppoon and Rockhampton. While Cyclone Lam is a category two storm which made landfall in the Northern Territory. Tropical Cyclones - These are low pressure systems that form over tropical waters (warm) and have sustained winds of 63 km/h or greater. Technically tropical cyclones are a non-frontal low pressure system of synoptic scale developing over warm waters having organised convection and a maximum mean wind speed of 34 knots or greater extending more than half-way around near the centre and persisting for at least six hours. Tropical cyclones attains their energy from the warm tropical oceans and it requires sea-surface temperature above 26.5°C for its generation, although once formed, they can persist over lower sea-surface temperatures. The centre of a tropical cyclone or is an area characterised by light winds and often by clear skies. Eye diameters are typically 40 km but can range from under 10 km to over 100 km. I Tropical Cyclone Less than 125 km/h Gales Minimal house damage. Damage to some crops, trees and caravans.Boats may drag moorings. II Tropical Cyclone 125 - 164 km/h Destructive winds Minor house damage. Significant damage to signs, trees and caravans. Heavy damage to some crops. Risk of power failure. Small boats may break moorings. III Severe Tropical Cyclone 165 - 224 km/h Very destructive winds Some roof and structural damage. Some caravans destroyed. Power failure likely. IV Severe Tropical Cyclone 225 - 279 km/h Very destructive winds Significant roofing and structural damage. Many caravans destroyed and blown away. Dangerous airborne debris. Widespread power failures. V Severe Tropical Cyclone More than 280 km/h Extremely destructive winds Extremely dangerous with widespread destruction.